Los Angeles and Boston Olympic bids: We should force cities to participate. 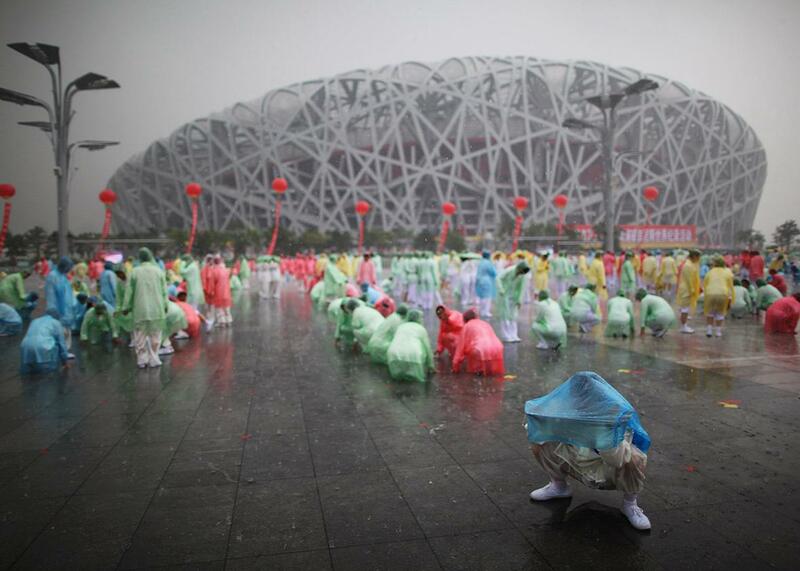 People prepare to perform tai chi in the rain outside the 2008 Olympic stadium on Aug. 8, 2009, in Beijing. Might this Bird’s Nest never need to have existed? But even before Boston was selected and then got itself unselected, both New York City and Philadelphia abandoned bids to be the U.S. candidate for the 2024 Olympics. The 2022 games, meanwhile, were beset by similar abandonments from Norway, Switzerland, Sweden, and Germany. There are plenty of nations that remain eager to host the games, of course, but many of these are ruled by autocratic strongmen who care little for the will of their people. The two remaining contenders for the 2022 Winter Olympics, the location of which will be decided later this week: China and Kazakhstan. For plenty of democratized countries, though, the prospect of hosting the Olympics can seem more like a curse—akin to smallpox, wildfires, and an extra-dimensional Chitauri invasion—than an honor. While disease can be treated, fire can be extinguished, and alien attacks can be repelled by Jeremy Renner, the negative effects of hosting the Olympic Games are not so easily counteracted. Olympic-related development inevitably displaces vulnerable populations and often speeds the pace of gentrification. The IOC requires each host city to agree to cover excess costs or revenue shortfalls in case the games end up overspending. And practically every Olympic Games overspends. “The average cost overrun from the summer Olympics since 1976 is 252 percent, after controlling for inflation,” writes economist Andrew Zimbalist. Citius, Altius, Bankruptius. And yet somebody has to host the Olympics. Right? There are rational solutions to this problem. They involve reforming the IOC, reining in costs by using existing facilities rather than always building new ones, and changing the bidding process so that it no longer hinges on the discreet transfer of large bags of money. But the Olympics are not a rational event, and so maybe a farcical solution is in order: The IOC should host a Shirley Jackson–style “lottery” to determine which nation will host the Olympics. Every single nation that wants to have an Olympic team has to enter. If you participate in the Olympics, you have to participate in the lottery. If your name comes up, you’re stuck with hosting the games. Here’s how it would work. Like in Jackson’s short story, we’ll begin by ritually stoning to death a random regional Olympic bid committee executive, as a reminder of the ephemerality of glory and the folly of human ambition. Just kidding! But we will egg said executive in a public square, also chosen at random by the IOC. Once that’s finished, we’ll proceed to the main event, which, like all good things, involves thousands of ping-pong balls and a gigantic air lottery machine. Every nation starts off with 25 ping-pong balls. After calculating the average world GDP, we’ll add or subtract balls for each nation based on how far a nation falls above or below that average, so that the United States would end up with far more balls than, like, Tonga. Then we pull the balls in and run the lottery. Aside from the very simple egging-and-lottery structure, there will be a few other key points. Nations can buy extra balls. There are some countries out there that still really, really want to host the Olympics, God bless ’em. These countries can spend $5 million per ball to increase their chances, up to 40 extra balls; the money will go directly toward the cost of the Olympics, whoever gets awarded them, as a kind of tax on wealthy autocrats that really want the games. Nations can sell their balls to other nations. Same as before, $5 million a ball, with the money being split between the selling nation and the cost of the games themselves. Here’s the catch: A nation can’t do this for two lotteries in a row, and if a nation chooses this option, the next time around it will automatically be given as many balls as the nation with the highest GDP. This would be done in order to disincentivize free riders who want to participate in the Olympics without ever having to host. No nation can host twice in a row. If you’re unlucky enough to get picked for 2024, then you’re out of the running for 2028. Obviously, this system is set up so that the countries that can afford to host the Olympics are most likely to actually get them. But it also leaves open the hilarious possibility that a country that does not want the Olympics and cannot really afford to host them will nevertheless be forced to do so. But the point isn’t to bankrupt poor countries. If, say, Dominica somehow ends up with the Summer Olympics, well, then, it’ll just be a Dominica-sized Olympics. All you really need to host an Olympics is a gym, a track, a pool, and a field. I assume that every country, no matter how poor, has at least one gym, track, pool, and field. Because this new system removes the various crooked bidding processes that lead to the overpromising and underbudgeting of facilities, winning cities will feel far less compelled to build extravagant and unnecessary white elephant stadiums, pay for infrastructure that they might not really need or be able to afford, and generally kowtow to the IOC in a way that damages its residents. What’s more, the lottery system will make it so that we’ll have different kinds of Olympics. Right now, various national idiosyncrasies notwithstanding, every Olympics is pretty much the same as every other Olympics, with the same top-tier facilities and stadia and such. If we assign the Olympics via lottery, we will probably end up alternating between lavish games and homemade ones, and this would be a great way of keeping in touch with the games’ amateur origins. I am absolutely sure that this system has lots of problems. But so does the existing system! If it’s a choice between two flawed systems, I think the world should always go with the one that is funnier, that results in a better deal for the local populace, and that involves a ceremonial egging. Am I wrong?